You have just bought a new filter for your equipment and now you are wondering why it does not work as it should? Or perhaps you have stored some filters in your eyepiece case and you are unsure about their precision? 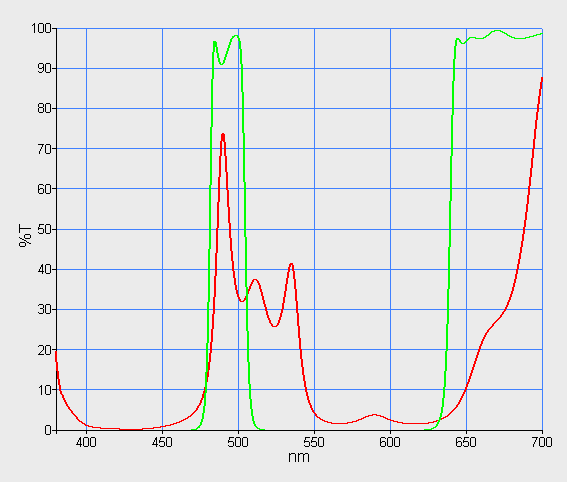 This diagram shows the transmission curve of an Astronomik UHC filter (green) and a UHC filter from a manufacterer in China (red). You won't see very much through the filter represented by the red curve. So in this case, the "cheap" filter turns out to be a bad investment. Are you curious about how the transmission curves for your filters would look like? So why not give our new service a try? 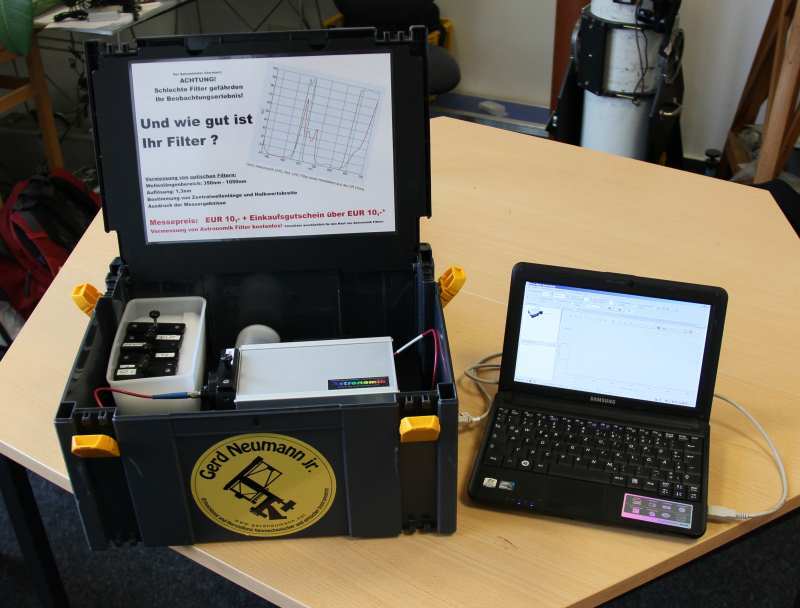 Our spectrometer can measure in the spectral range of 380nm–1050nm with a resolution of 1.3 nm. It can measure the transmission of your filter either across the visual part of the spectrum, or across the full range of the spectrum (from 380nm to 1050nm), or at an arbitrary wavelength interval – depending on your choice. Emission line filters are checked for the precise position of the central wavelength (CWL) of transmission and full-width-half-maximum (FWHM) spread. Further details can be measured upon customer request. Our filter testing service includes a detailed graphical printout of your results so you can clearly see how your filter performs. Our spectrometer is designed for high mobility. Hence, we decided to regularly take it with us during Astro fairs and telescope conventions. Come to our stand and get a measurement of your filters on the spot! Find out whether your filters can live up to your expectations! The charge for this service is EUR 25 (19% VAT included) or EUR 21 (VAT excluded for customers outside the EU). Günstige Filter für Deepsky- wirklich sinnvoll?